Imagine the sweet, soulful harmonies of Simon and Garfunkel, and place them into the unusual songwriting styles of Cletus Kennelly and Lori Kelley. The D.C-area songwriters blend contemporary urban folk with elements of melodic pop and alternative rock. Lori sometimes adds a dash of country to the mix. 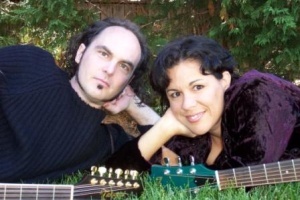 Award-winning singer-songwriters, Cletus and Lori met in 2000 and began collaborating on each other's material almost immediately. Since then, they've developed a style and a sense for each other's voices that is magical. Their work together has garnered them a Washington Area Music Association Award (Wammie) nomination for "BEST CONTEMPORARY FOLK DUO/GROUP." Says Gene Dawson of Dawsonconcerts, "I haven't heard harmonies this tight since Simon and Garfunkel." Both approach their writing from a lyrical, melodic place with songs that speak to the heart. The wit and depth each adds to the other's songs make for an engaging show. Scott Moore of Moore House Concerts adds, "Cletus and Lori are two standout solo performers whose voices blend beautifully." Cletus takes you deep into the human psyche with poignant lyrics, phonetic phrasing, and deft word play. He accompanies his clear, passionate vocals with the power and delicacy of his twelve-string guitar. He's a three-time WAMMIE-winner in the top categories for a singer-songwriter: "BEST NEW ARTIST", "SONGWRITER OF THE YEAR", and "BEST CONTEMPORARY FOLK VOCALIST." Cletus has earned a total of 30 songwriting awards, including ten Wammie nominations, and has had the honor of performing at the Kennedy Center Millennium Stage. In addition to his debut CD "Thread", Cletus has released a 2-song benefit CD with the WAMMIE-nominated "SONG OF THE YEAR," "Looking Up," written on September 13th 2001, and "Celestial Dance" a lyrical, driving, percussive serenity prayer. Lori lays her songs out with a natural understanding of thought and a contemplative tug of emotion. Wielding a four-octave range, her voice fills a room with radiant beauty and attentive presence. And who could ever forget that blue guitar? She's a two-time Wammie nominee, including "BEST CONTEMPORARY FOLK VOCALIST," and her songs were voted #1 by Northern Virginia Rhythm Magazine among all genres through the 1990s. She's shared the stage with Nashville hit songwriters Pat Alger, Tia Sellers & Mark D. Sanders, and Mark Selby. With her brand new release "Like Sea Glass," her third CD, Lori's style has evolved from kick-up-your-heels two-steps to melodic, tender ballads and laugh-out-loud, quirky, real-people songs.